Get our Newsletter: Click the link below to register. Determining the location of your test station is the first step in designing a safe and effective test station. The test station should be located away from traffic for the safety of anyone who may pass by the station and of course for the safety of the operator at the station. Limiting distractions to the test operator is an added step to ensure safety. The area should be marked with approved "DANGER - HIGH VOLTAGE" signs. The Hipot tester should have indicator lights to denote when high voltage is output. The test area should be separate from the assembly area. There should be ample power supplied to the test station. Verify that the power wiring meets electrical code requirements for polarization and grounding. Always use an outlet that has a properly connected protection ground. Serious injury may result if the Hipot tester is not connected to earth ground. Before connecting the 3- prong power cord between the unit and the AC power source, make sure the voltage selection switches on the tester are in accordance with the power source being used. Arrange the power line connections so that, except for emergency lighting, all power is interrupted by a single, well marked, palm operated emergency switch located at the outside edge of the test area. The test station should be constructed of nonconducting materials. An ESD mat is not a recommended platform for your test station, for it may cause erroneous readings. Metal objects should not be placed between operator and DUT. All other metal objects should be grounded. The test station should have sufficient space for the tester and DUT without the operator having to reach over the DUT to access the tester. The tester should be at least 3 inches away from the wall to provide proper airflow for the unit. Ideally the DUT should be isolated from the operator and tester. For larger DUT’s, which are wheeled to the test station, the cart should be non conductive with locking wheels. This is also true if the tester needs to be wheeled to the DUT. Keep the area clean and neat and arrange the equipment so that it is easy and safe for the operator to use. There are many safety features, which can be added to your test station to prevent the operator from coming in contact with high voltage. Guards or enclosures can be placed around a DUT, they should be non-conducting and should be equipped with safety interlocks that interrupt all high voltages when open. Interlocks should be arranged so that operators are never exposed to high voltages under any conditions. A Ground Fault Interrupt (GFI) circuit that monitors the high voltage output and return line is an excellent operator and instrument safety feature. The current exiting the instrument’s high voltage output (Isource) is measured separately from the current flowing through the device under test (Idevice). 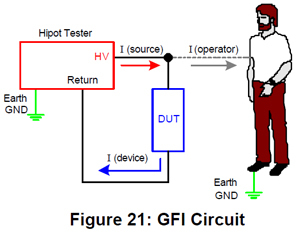 To stop the flow of this extraneous current, the GFI circuit is employed to detect a current imbalance (as small as 250uA) between the output and return, then shut down the high voltage immediately. Chroma, distributed under the QuadTech brand, was the first company to maufacture a production hipot tester with a GFI circuit as standard. Palm switches are an easy to implement feature to prevent the operator from coming in contact with high voltage during testing. 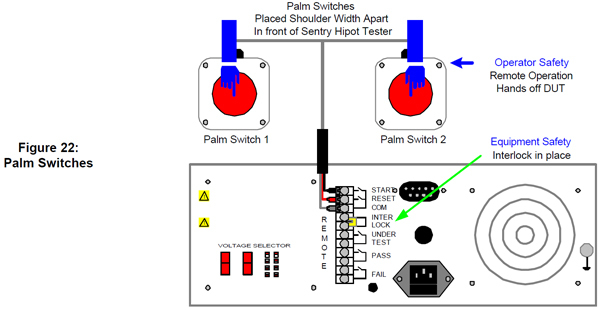 The basic operation of a palm switch requires the operator to use both hands to initiate a test and if one or both of the hands are removed from the switch while testing, the test is immediately stopped. The switches are placed directly in front of the operator spaced shoulders width apart. Spacing the switches prevents an operator from trying to press both buttons down with one hand or object. There is no high voltage applied to the output terminals and DUT until BOTH switches are pressed simultaneously. The operator cannot touch the DUT or test leads if both hands are on the palm switches. The switches are connected to the remote I/O on the Hipot tester, to the start, reset and common terminals. When the switches are in the down position the start is enabled, once one switch goes up the reset is enabled, terminating the output voltage of the Hipot. This method is safe, quick and effective. Refer to Figure 22. More elaborate test stations may use the Hipot testers Interlock for added safety. A light curtain is one safety method that utilizes the interlock. A light curtain is an infrared light beam that will open the interlock if anyone interrupts any part of the light beam. The output of the light curtain is connected the interlock terminal on the Hipot tester. If the interlock is open, high voltage is immediately terminated. The light curtain is placed in between the Hipot tester or the DUT and the operator. In order for the operator to touch the high voltage they would have to pass through the light curtain, hence opening the interlock, which will terminate the high voltage. If the Hipot is placed behind the light curtain there must be a way to start the test. A foot switch is an easy to implement method to start a test. Typical foot switches have two connectors. Connect one to the start terminal and the other to common, pressing the foot switch will initiate the Hipot test. Keep in mind you must ensure that nobody can reach the high voltage by going around the light curtain. Define safety procedures to be used in emergency situations and train all personnel in how to use them. Most Hipot testers will automatically discharge your DUT. This is not necessarily the case if there is a power failure. A "hot stick" should be available to discharge the DUT in case of a power failure or if the device becomes disconnected during a test. This is necessary because unexpected, dangerous charges can build up during a test if a connection comes loose. Having trained personnel is the first step to a safe testing environment. All operators should be given training in the basic theory of electrical circuits - voltage, current, resistance, AC vs. DC, Ohm's Law, and impedance. They should also be taught the effects of electrical currents on the human body and how best to avoid shock hazards. The operator should be in good health, operators who are pregnant or have heart problems are not recommended candidates to work with High Voltage. Explain the workings and importance of safety interlocks and why they should never be disabled. Explain the hazards of wearing metallic jewelry around electrical equipment and show how to interrupt power quickly in emergency situations. Hold regular meetings to review and update safety procedures and regulations. Program the necessary tests and store them in memory. Have a procedure available as to which memory location should be used for each device being tested. The procedure should also outline the test being performed (AC or DC, voltage, test time and limits). Use the key lock feature on your tester. This will avoid your programs being changed to unknown and unsafe values. Explain the object of each test, show how it should be executed, and show how to handle every normal and abnormal situation that may occur. Make sure each operator understands how much he or she can handle alone and when supervisory personnel should be called in for help. Consult with your local OSHA chapter for specific guidelines on incorporating the minimum performance requirements for the control of unexpected hazardous energy. This is specified in the OSHA 1910.147 regulation. Some basic guidelines for performing electrical safety tests are outlined below. 1. Do not make any connections to a DUT unless you have verified that the High Voltage is OFF. 2. Never touch a DUT or its connections during a test. 3. When connecting leads to the DUT, always connect the Ground clip first. 4. Never touch the metal of a High Voltage probe directly. Only touch the insulated parts. 5. Use interlocked test fixtures only. 6. Verify all DUT connections before starting a test. Make sure that no other objects are near the DUT or the tester. 7. Keep the area neat and uncluttered and avoid crossing test leads. 8. Follow the prescribed procedure for each test exactly as written. 9. Verify all setup conditions before starting a test and examine all leads for signs of wear. 10. Verify the tester is functioning properly by use of a load box. This will also confirm the condition of the test leads. 11. Have a "hot stick" handy when performing a DC test and use it to discharge any connection or device that may become disconnected during a test. This is necessary because unexpected, dangerous charges can build up during a test if a connection comes loose. 12. At completion of a test turn OFF the High Voltage. If the test was DC, discharge the DUT for the prescribed time.